Cut off parts of the measurements and only keep the last 17 years. Plot all the months of these 17 years to get plenty of data points. A good idea is to show a streched plot with longer time axis. Plotting the monthly anomalies of the global mean temperature. At least, many different global analyses were shown – not just the one which indicates weakest trends since year 2000. The data presented in this case included both surface analyses (GISTEMP, NCDC, and HadCRUT3) in addition to satellite products for the lower troposphere (Microwave Sounding Unit – MSU). The MSU data tend to describe more pronounced peaks associated with the El Nino Southern Oscillation. A comparison between the original version of this plot and my reproduction (based on the same data sources) is presented below (here is a link to a PDF-version). Note, my attempt is very close to the original version, but not identical. One should note that plotting the same data over the their entire length (e.g. from the starting date of the satellites in 1979) will make global warming trends more visible (see figure below). Hence, the curves must be cropped to give the impression that the global warming has disappeared. 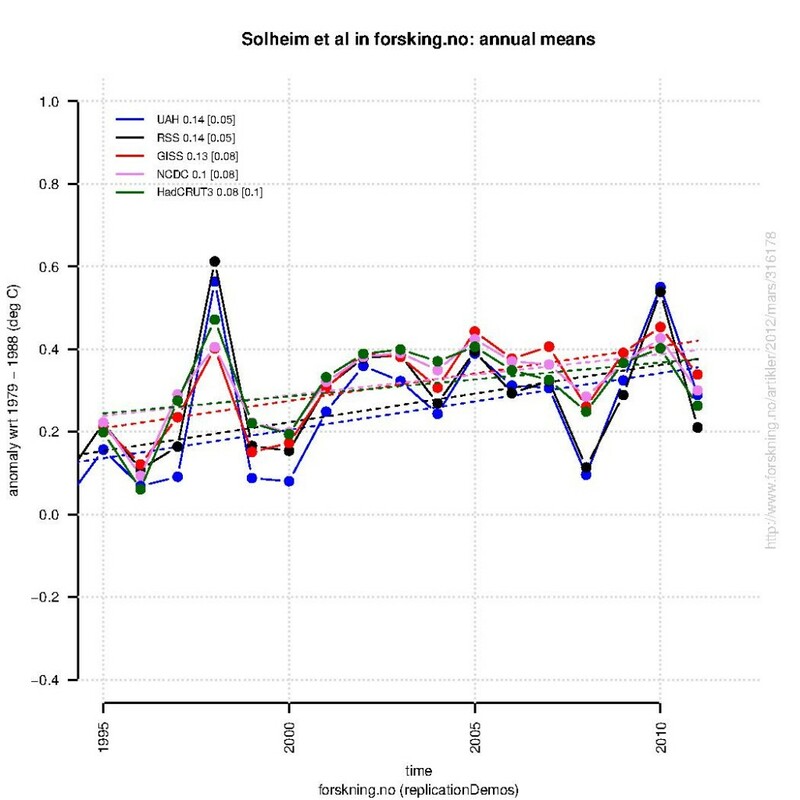 A linear trend fit to the annual mean anomalies the last 17 years suggest similar warming rates as reported by Grant Foster and Stefan Rahmstorf. These trends are derived from exactly the same data as those used in the original figure, that was used to argue that the global warming had stopped – by two professors and a statistician, the very same who performed curve-fitting and removed data not fitting their conclusion. The real trick is deciding on the end points. Since global average surface temperature exhibits a long-term sinusoidal trend, one can display either a positive or negative trend with careful start and end point choices. Your mileage may vary depending on your destination. “by two professors and a statistician…” So which one is Inferno? This is another great example why archiving/providing as much of the data (and any manipulations to it) as possible is useful for science. Since 30-year trends are the new ‘meme’ I’ve been looking at running 30-year trends. For example, the rate of increase from 1850 to 1880, from 1851 to 1881, and so on.Using three long-term global data sets it shows an underlying increase but clear fluctuation in the rate. There were maxima in the 30 years up to 1882, 1941 and 2004, and minima in the years 1907 and 1967. When I was a student studying chemistry I would frequently see a text for a class I regret not taking. Class was an upper division statistics class, the text was “How to Lie with Statistics”. Whenever I see graphs or data provided by politicians, advertising agencies or climate deniers, I think of that book. Fascinating plot. The model ensemble should average out internal variability of the climate/weather system and leave only the forced response. 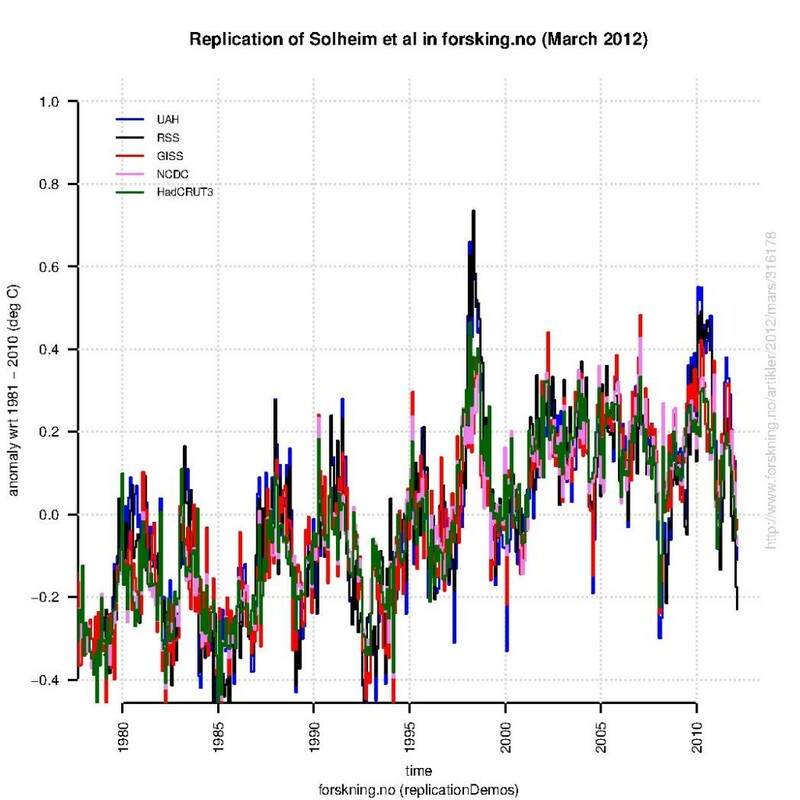 This is seen in Johanessen et al 2009, “Arctic climate change: observed and modelled temperature and sea-ice variability.” They find that the recent warming appears in all model runs, whereas the 1940s event does not appear in model runs, although similar warming events appear at different times. See fig 1 and text. Why do you think any of the above is true? You refer on your blog to “possible future climate change over which we have no control” — why do you believe we’re not controlling climate now? There’s something I don’t understand. When I run linear regression over UAH data between 1994 and 2012 as per both the original graph and your reconstruction, I get the same trend value regardless whether I run it on monthly or annual averages. Of course it’s a positive trend exactly as in your fourth figure. The original graph however does not seem to talk about trends over that period but about “net change relative to average 1979-1988” – which is supposed to be zero particularly for UAH. As I assume you have access to the whole paper rather than just the graph, could you please explain what net change is meant there? Oh, you’re a WTF guy. The ‘Hayduke’ nickname had me hoping for science, but, no. What does “WTF guy” mean and what does it have to do with Hayduke? What does Hayduke have to do with science, for that matter? Is this a blog where everyone trashes everyone else based on labels? What about content? I hope this is not a site promoting the idea that only human activity influences climate change. This would be an unfortunate position, since it is quite evident that climate did indeed change before humans came on the scene, let alone before humans had any means of influencing climate. There are natural factors influencing climate over which we have no control, neh? > human activity influences climate change. Not remotely. I’d recommend using the ‘Open Thread’ for the month if you want to talk about yourself and what you believe people here think, so we don’t distract from the topic here. I’ve put a response to you there. Yes, of course there are natural factors that influence climate. They have very little to do with the rapid warming we are seeing at present, which, if we are not to deny the evidence, is overwhelmingly due to anthropogenic greenhouse gasses. I hope this is not a site promoting the idea that only human activity influences climate change. Despite being burdened with a PhD I think it’s reasonable for us to expect you to be capable of exploring the site a bit before making silly statements. Do you see the “start here” link at the top left corner of the home page? Hint: it’s meant to be taken literally. OK, so reading your site, you’re a PhD in Anthropology, and a survivalist with an interest in the eco-warrior fantasies of Edward Abbey (who himself was wise enough to make no effort, for the most part, to live them). Exactly the credentials that will convince people that we’re seeing a “long-term sinusoidal trend” (odd use of “trend”, BTW, you’re supposed to conclude that there’s *no* trend, maybe you should try copy-pasting denialist talking points directly rather than paraphrasing them?) rather than warming. He’s suggesting you’re a denizen of Watts Up With That, a motely crew of folks who, when it comes to knowledge of science, for the most part fall far short of the blog’s host’s high-school degree. No, this is a site where all the forcings on climate are investigated, human and natural. The fact that human factors are forcing current warming trends is one outcome of those investigations. Eyeballing it (I don’t want to figure out how to get the raw numbers), I am convinced I’d get the same result as Kasuha, a significant linear trend if I did a least squares fit to a linear. But of course for the writer interested in disinformation, he can hand draw a flat line, and fool the uninitiated. What is your PhD in? Naivete and Ignorance? In other words your post displays a tremendous amount of ignorance. You jump straight to a conclusion and obviously have not looked at the tremendous wealth and depth of material discussed on this site. It’s funny, people think that just because someone has a PhD behind their name that those individuals will automatically make sense. You have displayed a good example of how that simply is not true. Aren’t you ignoring the unknown unknowns here. Isn’t it possible that some humans may have figured out how to influence pre-human climate by teleporting thought waves through space/time anomalies? I mean if we are going to fantasize, hey, why not go big! There’s probably no stopping the stats trench warfare anytime soon. The pro-pollutionist put number-crunched honey in the trap, and whistled a short tune. Now everything from climate science to the world’s largest pollution problem is on sabbatical. Brag about the size of your graph! 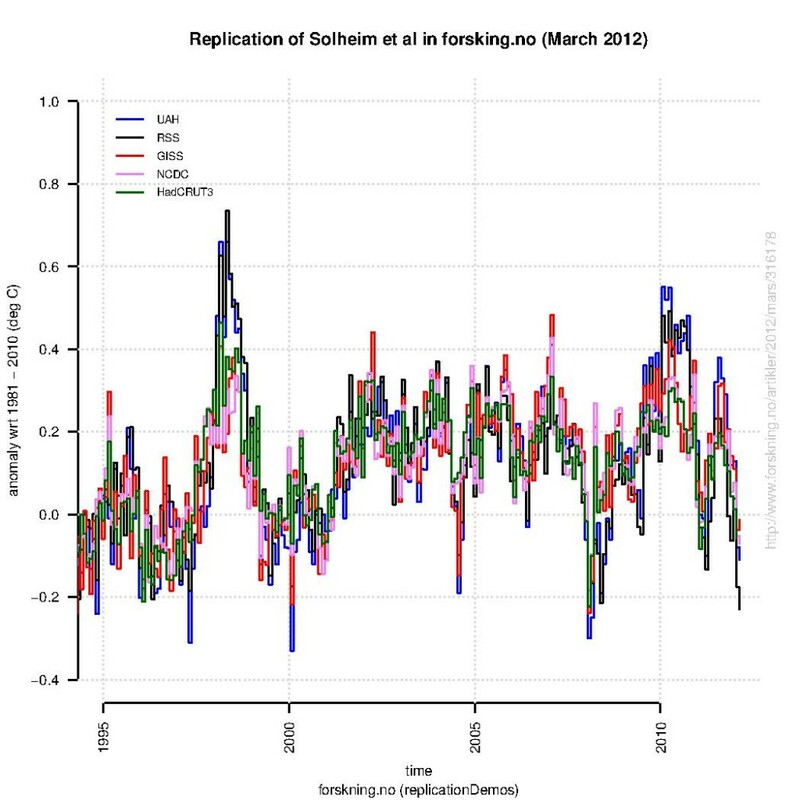 Brag about your graph respecting all the time series; all the weather-noise; and all the chaos! Brag about how your graph satisfies all the evidene! Draw attention to their tiny little graphs! To their short attention span! To their need to compensate for an inability to satisfy the evidence! Is there a link to the original work/paper? Foster & Rahmstorf is referenced but not Solheim et al. Which journal is this from? A couple of comments; I’m guessing, without seeing the paper, that the 17yrs is from Santer et al (2011?). Also, I’m struggling to see the “trick” in plotting monthly values rather than year anomalies for such a short time period. The calculated trend should be the same. A quick visit to Wiki and Amazon shows “How to Lie with Statistics” by Darrell Huff is well known, in print, and available. Owl905: I am far from clear what point you are trying to make. Are you trying to criticize the author (Rasmus) without saying anything that could be used against you, while being a smart Aleck? The subject of time series trends using different degrees of discrimination raises an important statistical point. What is the importance of autocorrelation in these series and how should it be accounted for, if at all. I am no time series expert, but my understanding is that autocorrelation articifically infaltes type I error rates by diminishing the effective degrees of freedom. Often such data sets are detrended to see the autoregressive structure of the data more clearly. But of course, we want to see any trends that exist in climate data, right? So is there a way to remove the autocorrelation – or at least to allow for it in such a way that you can analyze the trend with appropriate degrees of freedom, in the absence of autocorrelation? I’m just geting a feel for the discourse here. I see nothing different from the “denialist” lists. 2 Michael A. Lewis, Ph.D wrote: “sinusoidal trend”. I’ve personally examined ALL the temperature data for the lifetime of the planet and I’ve made not one but two great discoveries. 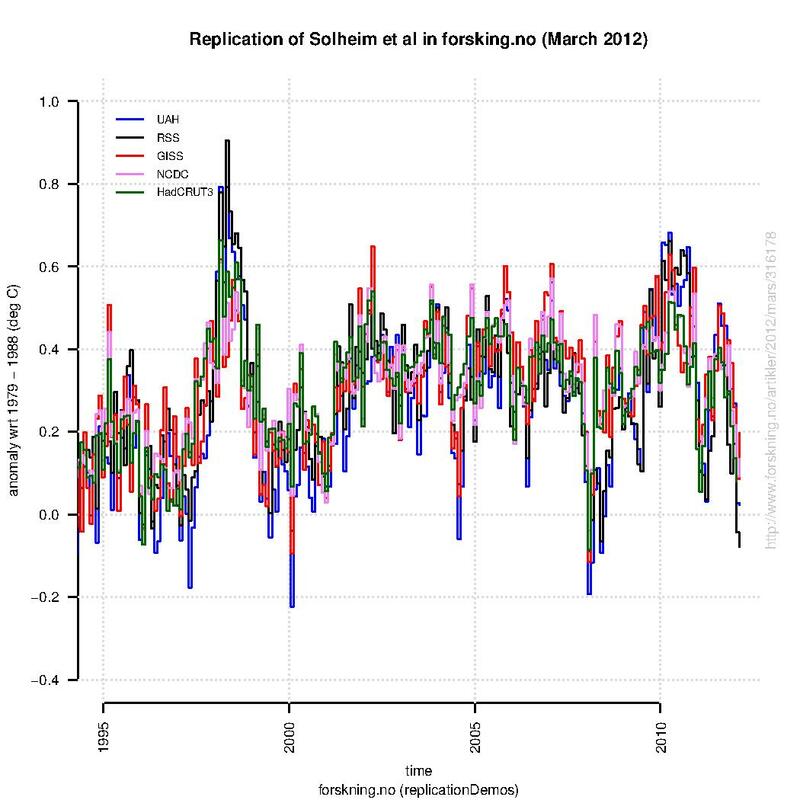 Great discovery 1: every pair of temperature maxima are separated by a temperature minimum. Great discovery 2: every pair of temperature minima are separated by a temperature maximum. There are as many increases as decreases. THE CONCLUSION IS INESCAPABLE!!! COOLING IS AS LIKELY AS WARMING!!! As my paleontology teacher used to say, there are two kinds of people in the world: lumpers and splitters. Looks like you’re a lumper. Of course you’d expect a scientist to be willing to invest time analyzing the classes in question before making that decision. And you’d especially expect an anthropologist to be nuanced in assessing the social context of a conflict like this. OTOH, are you by chance one of those magical Carlos Castaneda type anthropologists? One who thinks any naming is just an arbitrary cultural invention equal in value to all other namings — the only inferior system being that of the mad robot scientists who secretly rule the world? 17 data points has less significance than 204. Yearly values has been the standard forever. Going to months is a huge deviation, for which there must be a motive. Perhaps it’s to artificially increase the statistical significance. Woo, a twofer! Both increases statistical significance and decreases the trend, and all done by going monthly instead of the standard yearly. Another ‘Pot meet Kettle’ moment… Well, thank you for the hypocrisy. Why is it that you think we/I don’t know how to use the internet? Why is it that you think we/I can’t see what you have written already? Why is it that you are inferring that we/I are somehow guilty of pointing out that you are hypocritical in your posting here? You are basically arguing from your own lack of knowledge of the science, you feel justified coming into RC, playing innocent, and indirectly accusing folks (such as myself) of not being nice to you. You use tired old non-science arguments to say climate science doesn’t know everything therefore we do not have enough knowledge to make any decisions. That’s simply false. From your comment its not clear whether or not you have looked at the link I gave. The significance was not that maxima were follwed by minima but the timing which suggests a multidecadal periodicity in the temperature trend. This is very obvious when you follow the link. English is a wonderful language that way. We can use words to convey thoughts beyond their original intent. He’s talking about the supposed ~60 year natural cycle over a benign recovery from the little ice age, as slightly influenced by mankind’s emissions. It all sounds grand, but unfortunately it just ain’t true. Michael, if you’re here to learn (they never are, sigh), then go to “Start here”. Skeptical Science has some great resources too. After spending a night digging, come back here to the Unforced Variations thread and give alternative hypotheses or ask questions. This site, used correctly, is an awesome resource. Excellent lesson in how to pick data cherries. Seems the skeptics of anthropogenic climate change really don’t need any lessons as they are quite the experts already, and the cherries they pick tend to be of the psychotropic variety, leading to all sort of interesting mental states. An of course while studies such as Foster & Rahmstorf and others have shown the underlying warming of the troposphere that is continuing when background noise is eliminated from the longer-term signal that growing greenhouse concentrations are causing, the important message of warming is not found in the troposphere at all, but in the cryosphere and oceans, where the last 10 years (rather than being somewhat flat like the tropopshere has) have been warming at accelerated rates. Given that the cryosphere and oceans are far better long-term indicators of changes in Earth’s energy balance than the much more “noisy” troposphere, for anyone to suggest that the warming of the Earth system has slowed or stopped over the past 10 years, means they are purposely ignoring the far bigger heat sinks of the cryrosphere and oceans, or they simply want to spout nonsense. When all (or most) of the factors that contribute to climate are considered, it is obvious that cyclical patterns will result over long time scales. World climate conditions will change as the oceans and atmosphere seek new equilibrium conditions. Your capitalized conclusion is thus devoid of useful information content. Sure, there will be short term ups and downs in average global temperatures, but what matters is the longer trend toward a new “stable” condition. What will the world look like when this new equilibrium is achieved? That is the issue of concern, and it matters little which side wins the debate since our political system is so badly broken. @Doug Rusta 35 – It is not obvious that cyclical patterns will evolve over long time scales. In fact, cyclical patterns grow and die subject to the physical and chemical evolution of the planet. The most recent big example is the anomaly drainage of the mid-North American ice-age sea (Lake Agassiz) into the Arctic. It may not be a co-incidence that the current long Holocene plateau is a function of that anomaly. Likewise, AGHG is not cyclical – it’s an event disruption that could very well overwhelm some basic natural cyclical patterns. JPearson’s remark was an excellent indictment of how to twist a statistical tautology into an agenda. I took a look at the Michael Lewis boreholed comment out of curiosity. How he is coming to his conclusions is baffling. He says the most recent warming period is the last 1.5 million years, but data indicates that we went form a more stable warmer state with smaller oscillations into deeper oscillations into colder states. This indicates a general cooling trend on average for the 1.5 million year period in question. How does he come to the idea that a cooling period is a warming period one can only wonder? I would like to know his source for this assessment. Michael, care to share? Or is your source for this data and your assessment of 1.5 million years of warming a secret? The full graph look more like a step to me – would you be so kind as to re-plot the trends witha break-point analysis? 35: Doug: You’ve exemplified a big problem with Real Climate. I found the notion that someone thinks it’s profound that every two maxima are separated by a minimum to be pretty funny and on intellectual par with the vast majority of denialist arguments. I remember quite well one of my earlier attempts at humor here after Texas Rod claimed that a short lived downturn in the temperature record meant that x years of warming had been wiped out. I found Rod’s comment idiotic beyond belief so I wrote something to the effect that “alarmists call them seasons” or some such. I understand that humor is a dicey business for a professional physicist to engage in but still I can’t help myself. I was surprised, though, at the hostility on the part of otherwise intelligent people. I was immediately called an idiot by Hank Roberts and a bunch of other people some of whom made up some fairly silly stuff in order to attack what they perceived as denialism on my part. There is a well-heeled denial machine that in spite of the science operates with great effectiveness. You cannot defeat it with reason. You cannot defeat it in the schools. You can hope to defeat it with humor. Possibly you can defeat it with music. You cannot defeat it with humorlessness no matter how sincere you are. Of course, you are not accounting for reason in this statement. Attribution is critical to understanding. If you ignore the reasons why things happen and focus on the ups and downs, you can conclude much less to very little, if anything at all. It is the ‘reason’ that the temperature goes up and down at different times under different circumstances that counts toward understanding. Knowing some like you and some dislike you as data points provides no understanding as to why. hmmm… or were you just being humorous again? Always possible he’s considering changing his mind, though. People do. I understand your concern. I do not believe I am being unduly harsh though. Reasonable people can learn and I hope he is one that can. But from what I’ve read of his writings on WUWT it seems clear he is not basing his assumptions on science, or science in context. In fact there are leanings indicated toward conspiracy. Conspiracy theorists are hard to turn around. I did a talk about a month ago and it was a particularly tough crowd. 61% thought global warming was a conspiracy. After one hour that number was dropped to 33%. If I had two hours I might have done even better. But I think it is much harder to turn a conspiracy theorist around via a blog. If Michael Lewis is actually basing his perspective merely on bad data and is not belief oriented then he has a better chance of learning. I for one am very curious how anyone can think Earth has been in a warming period for 1.5 million years? I have never heard that claim before and all the evidence I’ve seen indicates otherwise. I hope he can quote a source for that assumption though. I would like to see it. as there will always be some who don’t get it otherwise. Having trouble finding ‘The Bore Hole’? here’s how to find stuff. 4) on this website, look in the right sidebar (you’ll see the same words the “find” command hilights). That’s the last item under Categories. It’s a link; click it. Note: people are people; some will be rude; some will be helpful; some will be both rude and helpful, as explained here: How To Ask Questions The Smart Way; and some will not say a word til they get a feel for whether you’re going to bother learning what’s available. So what you’re really saying then, is that a trend over the last 17 years is not enough to establish anything. 30+ is what is needed. Yes? John E Pearson, You speak of a “well-heeled denial machine”. Realistically though, what they spend is peanuts compared to what government spends on – adopting your own terminology style – what one might call an “alarmist machine”.